Some dogs are happiest in the great outdoors, others cosy on the sofa. Your dog may love the company of other dogs, but someone else’s may prefer human company. Mine is, as his nick name goes, is happiest when he is glued to my side and following me from room to room. When he’s had enough of me, there are his beloved blankets of course. 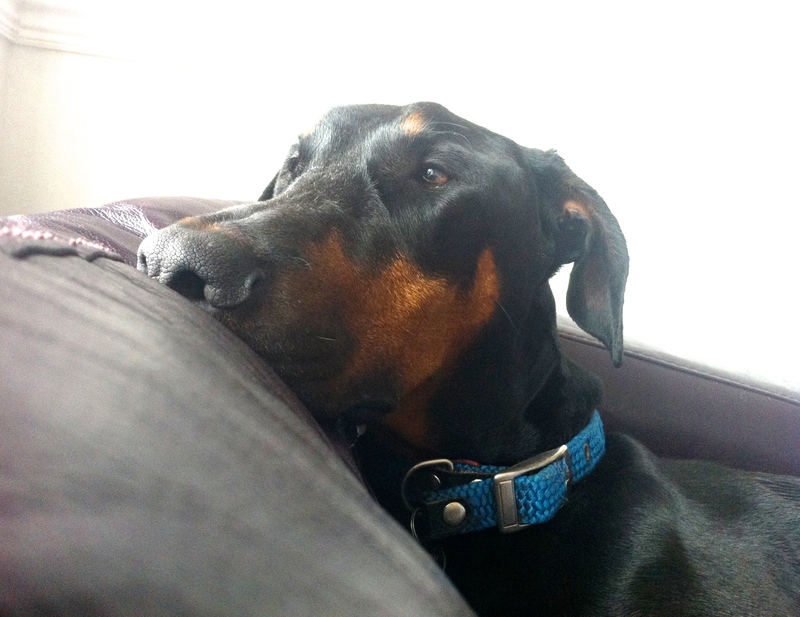 He’s also partial to our corner sofa with a view of the street, for his afternoon nap… Like us, every dog is different, but there is nothing better than a happy dog. I’ve been inspired by things I’ve read and watched online these past few weeks, so here are my top five ways to make your dog happy (OK they may inadvertently make you smile and laugh too, but that’s cool). 1. Take your dog to the beach, but don’t forget to strap a GoPro camera to him first. The end of this video is the best bit, you can see the pure joy this dog has for swimming! 2. Fashion your dog a giant spider costume and let them be the star of their own horror film. This is the best video I’ve seen for a long time. 3. Always thought your dog has super powers? Turn him into a real hero with a white sheet and a few Sharpies. Check out the Instagram account below for more fab drawings with Jimmy Choo the English Bull Terrier. 4. Dogs love to play and dogs love food. Blow their tiny minds and combine the two with an interactive feeder game from Swell Pets. Lupo has one of these and I need a towel on standby when he’s playing due to the drool! A great sign of course. 5. You may think your dog is badly behaved if he doesn’t come when you call him, but what if he hates the name you chose for him? Give your dog a name that won’t see him hiding in the bushes in shame when you shout it in the park. That means you, Paris. ‘Prince Hilton Mr Amazing’ is not a suitable dog name.